Description The rodents that most commonly invade homes are mice and rats. Like all rodents, they have continuously growing, sharp incisors in their upper and lower jaws. They also have robust bodies, short limbs, long tails, and they like to burrow. Rodents are highly adaptable animals that have spread around the globe. Rats infamously proliferated the Black Death, which led to the deaths of millions of people in the 14th century. 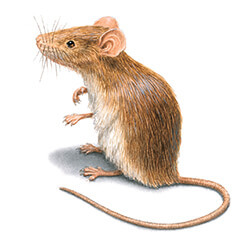 The most common types of rodent pests in Canada are the house mouse, Norway rat and roof rat. Some burrow underground while others live in nests on the surface. Hollow logs, tree roots, and tall grasses provide protected places for rodents to shelter. Mice prefer forested areas, pastures, grassy fields, and farmland, and usually hide in underbrush or other dense vegetation, such as tall grasses, shrubs, and vines. However, in populated areas, mice tend to live near humans and readily available food sources away from the threats of predators. In the wild, rats burrow underground, near another structure which can provide overhead shelter. In urban areas, rats colonize in attics, burrows, under concrete and porches and in wall voids or other hard to reach places. The Norway rat is nocturnal. Both the Norway rat and roof rat prefer damp environments, while roof rats prefer to settle in higher locations. Rodents like to be warm and temperatures below 15°C normally bring them inside. As mammals, rodents give birth to litters of up to 12 live young after carrying them for around 20 days. Newborns reach sexual maturity after a month or two. In the wild, the mating season is from early summer to fall, but indoors, rodents breed all year round. They generally live no longer than a year. Rodents invade homes seeking food, water and warmth. They aggressively seek shelter in the fall as temperatures begin to drop. Mice and rats often find refuge in homes, businesses, industrial factories and warehouses, dog houses, sheds, barns, or lawn ornamentations. Rodents often enter through back rooms or storerooms when doors are left open and frequently gain entry under roofing tiles via the rain gutters. They can also squeeze through very small holes and cracks in the siding as small as 1.75 cm wide. Rats and mice will eat almost anything. Some prefer fruit, vegetables and meat, while others can survive solely on seeds and grains. Mice and rats can be just as satisfied with organic waste found in dumpsters as they would be with a piece of fresh food. Almost any source of moisture around your property will also attract thirsty rodents. Rats must have water to survive, and although mice can get most of their water from moisture in their food, they certainly won’t reject water if it’s readily accessible. How worried should I be about rodents? Some mice and rats can carry and transmit Hantavirus, a rare respiratory disease, in their saliva, urine, and faeces. This disease can be fatal in humans and there is no known cure. Mice can also transmit diseases like tularemia, lymphocytic chorio-meningitis, and murine typhus, while rats can transmit bubonic plague, Weil’s disease, toxoplasmosis, and trichinosis. Rats and mice both contaminate food with their faeces, urine, and saliva, and can introduce parasites, such as fleas, lice and ticks into your home. Rodent remains also pose a serious health hazard to humans. Rodents can also cause major structural damage to your home or business when they burrow through walls and gnaw through electrical wiring, causing power outages, provoking electrical fires, and forcing expensive repairs. As well, oils and dirt on mice and rats’ skin can rub off and cause discoloration along the walls as they squeeze through tiny holes into the building or scurry along the side of room. For business owners and property managers, a mouse or rat infestation can be devastating, ruining their reputation, harming their ability to sell their product or rent apartments, and potentially destroying their ability to operate at all. As soon as you see a rodent invade your property, it's essential to begin rodent control measures immediately. If not rodents can multiply exponentially. Without mouse control intervention, one pair of mice may produce 200 offspring in four months. To catch rodents, snap traps and glue boards are best, as they do not require chemicals. However, rodents instinctively avoid or escape bait and traps, and larger rodents can escape unsecured glue boards. Tamper-resistant bait stations containing rodenticide bait blocks can also be used around building exteriors. These block non-target organisms, such as children and pets, from accessing the bait inside. But these traps and baits don't get to the source of your pest problem. Preventing rodents' return requires a sanitation program, community education, staff training, strategic landscaping, and possibly even structural changes. For truly effective long-term rodent control, you need an integrated pest control management program provided by professional pest control services. How can I prevent rodents invading?